A majestic fish, Cheddie does it true justice. 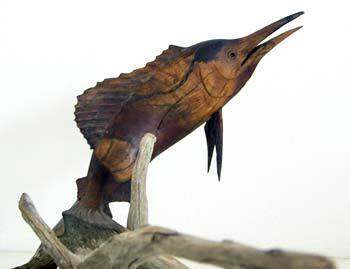 You can almost feel this powerful fish leaping out of the "driftwood waves." "When someone catches a 200 pound swordfish, it's known throughout the island within hours -- and it ends up at every expensive restaurant on Anguilla." Thankfully, this one ended up immortalized.